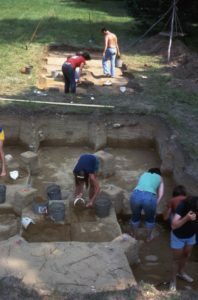 The Templeton Site (6LF21) is a 10,190-year-old “Paleo-Indian” site located on a terrace of the Shepaug River in Washington, Connecticut. 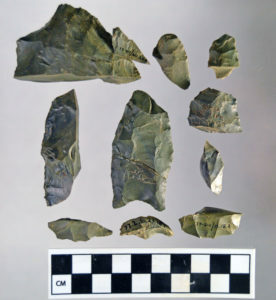 Archaeologists believe that Paleo-Indians used the Templeton site for just a short period of time during the Paleo-Indian period and that it was a relatively temporary tool-making camp rather than a more permanent settlement. This is an example of how many different camps had diverse functions within the New England area. One of the most important finds uncovered at the Templeton Site was charcoal that came from red oak and either juniper or white cedar. 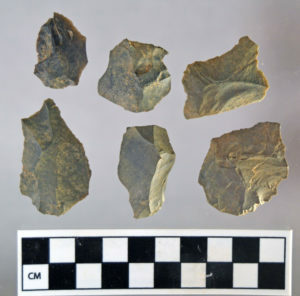 These were identified by an archaeo-botanist, who specializes in identifying plant remains from archaeological sites. The type of wood is significant because prior to this discovery, Paleo-Indians in the Northeast were stereotyped as “big game hunters” surviving on mastodon meat as they wandered through a tundra environment. The oak, juniper and cedar charcoal found at this site helped to change that stereotype. The presence of these trees in the environment 10,000 years ago points to a much more diverse landscape with denser forests and a variety of micro-environments than previously believed. The deciduous tree charcoal also suggested a more diverse fauna (such as white-tailed deer, which browse on oak leaves and acorns). 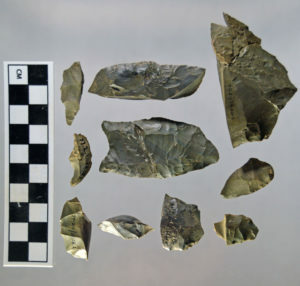 While Paleo-Indians may have hunted or scavenged on large game such as mastodon and mammoth, it is more likely they focused their hunting energies and efforts on easier game such as deer or woodland caribou. In fact, new research suggests that Paleo-Indians in New England relied heavily on the migration of caribou for food and other resources. They would follow the herd of Caribou leaving small camps in their wake. The Paleo-Indians would need these temporary camps like Templeton in order to make tools on the move. But, some camps were more permanent and used for long term living. Just as well, the Paleo-Indians would store tools in these temporary camps for later use when the caribou returned to the area the next year. 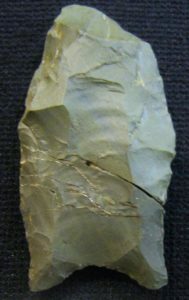 Paleo-Indians were also assumed to be moving around in a very nomadic fashion. Templeton suggests that people at this time would have been highly mobile, but not as nomadic as previously thought since the environment would have offered more resources than assumed in the “big game hunters” subsistence model. But mostly, the hunters remained in motion, following the migration patterns of their prey. This same site was occupied again during the Early and Late Archaic periods based upon radiocarbon dates. This was clearly an important site to the people of the area since they returned to the site again thousands of years later for further exploitation of the local natural resources. 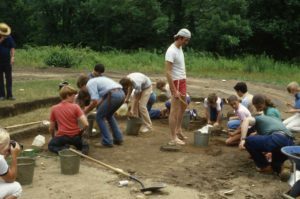 1984, Paleo-Indian and Early Archaic Occupations in Connecticut. Bulletin of the Archaeological Society of Connecticut, Volume 47: 41-47. Edited by Renee Kra.